Summer has arrived in Forza Horizon 4 for the first time this year once again bringing with it a number of delights for Forza fans. Players can now grab the Hot Wheels Rip Rod vehicle by winning the “Hopped Up” seasonal event – the very first Drag racing seasonal championship found in PvP. 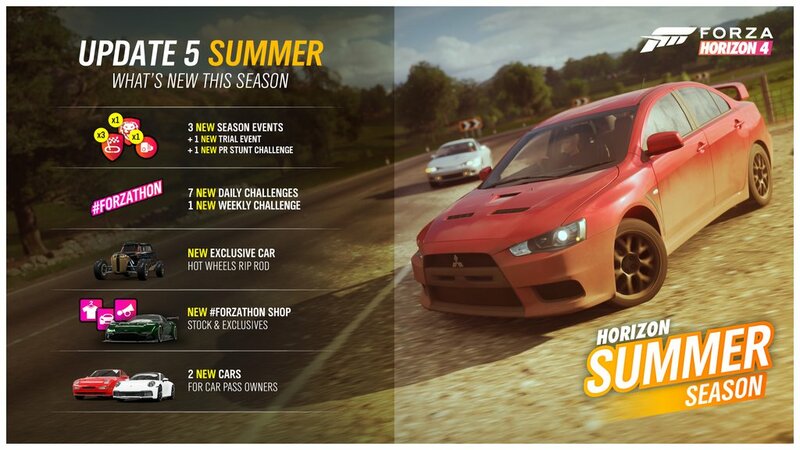 A total of three new season events are added to the game including a new trial event and PR stunt challenge with racing suits as rewards. Seven new daily events and one new weekly challenge have also been added to Playground Games’ open-world racer, as well as the usual Forzathon Shop updates. Finally, there are two Porsches up for grabs for Car Pass owners in the shape of the 1993 Porsche 968 Turbo S and 2019 Porsche 911 ‘992’ Carrera S.
If only it was Summer in Britain right now *shivers*.